On the surface, Manjhi: The Mountain Man is a fairy tale: easy fancying, hard believing. That doesn’t, however, quash the fact that it’s a true story despite all the oddities of it being one. The film begins in the middle of the action, as we watch the anguished male protagonist trying to set ablaze a rocky mountain, painfully realizing that if not for the atrocity of the mountain his wife would have been alive. The movie incorporates a few flashbacks to highlight past events that have brought the man to this point. The storyline bears far more potential than what the movie assigns it; still, I can’t help but concede that some moments in Manjhi: The Mountain Man are beautiful enough to produce a bittersweet mood in and around us. Until a few decades ago, many Indians grew up listening to Bollywood songs like O Manjhi Re Apna Kinara Nadiya ki Dhara (meaning: Boatman, in the course of the river lies my shore) and Manjhi Chal O Manjhi Chal (meaning: let’s go Boatman, let’s go) . In India, among many people, the word “Manjhi” is used to refer to a boatman. Further, there is a cultural imagery associated with the word: a messenger of God who assists people cross the course of life, which is akin to the course of a river. There was a time when an entire community survived on the service of the Manjhi. With the advent of modern means of transportation, the man and also the word gradually lost significance. Quite fortuitously though, in Manjhi: The Mountain Man, our main character, Dasharath Manjhi (Nawazuddin Siddiqui), turns out to be a Manjhi in the real sense of the word: as if his surname designed his fate for him. The film takes place in a time in the history of India when promises of better communication facilities, made by the ministers for a ‘newly envisioned progressive’ India, kept sinking in the swamps of corruption. However, Dasharath Manjhi was resolute about breaking each and every rock: literal as well as figurative, even at the risk of being called a lunatic, to build a road through the mountain. The literal reference is made to the mountain which stood between the village of Gehlaur and the bigger world outside it. The figurative reference is insinuated towards tradition, in the form of the caste and feudal system, which stood like a staunch unyielding mountain on the path of social mobility for the lower caste people. Dasharath Manjhi showed signs of turning into a romantic rebel at a very young age. He left home to escape being a bonded labourer, found employment in coal mines, earned cash and returned home to live with dignity. Later, as a young husband he fought against all odds to protect the love of his life- Phalguni Devi (Radhika Apte). To call this person a ‘Musahar’ (the lowly people who fed on rats) is nothing but a misnomer. He was no Musahar; he was a spirited lover. His world centred on what most of us fail to achieve: faith in love. It wasn’t just his love for his late wife which rendered him the strength to persist in his effort; it was his love for life in general. The movie abounds in instances where we confront the lover in him: when he bestows on his wife all the comfort he could afford; when he chooses to travel more than 1000 kilometres on foot to meet the Prime Minister of India; when he opposes the use of arms for fighting feudalism; when he rejoices at the journalist’s successful attempt at bringing out a newspaper of his own and mostly when he talks to the mountain as if the mountain was his own true love. His anger was not posed against the mountain, rather it was against the arrogance the mountain donned; he wished to remove it through his love. A full length Bollywood feature film is likely to mould a real story into its web of fantastic fiction. Some parts have definitely been fabricated. 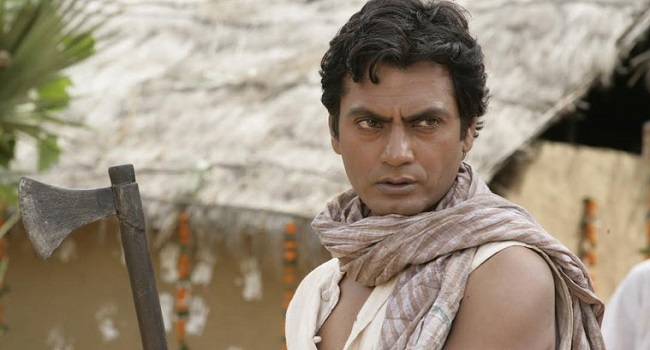 Yet, if Nawazuddin Siddiqui suddenly declares he is the real Manjhi, I won’t be surprised. None other than Siddiqui could have done justice to this amazing character. It’s the anti-hero facet in his acting that made the character so believable. On top of that, his mastering of the dialect gave a sense of authenticity to the on-screen characterization of Dasharath Manjhi. For years to come it’ll be hard to figure out where the real Dasharath Manjhi began and where the Dasharath Manjhi-on-screen ended. Kudos to director Ketan Mehta for his attempt at exhibiting a realistic portrayal of India’s past, complete with hints of humour. The few flaws can be found in Mehta’s intent to situate the film as something more than entertainment while still succumbing to typical Bollywood romance tropes. He romanticized Manjhi’s and Phagunia’s love far more than necessary. Furthermore, the cinematography oscillates between that of the parallel cinema of the 1950s and the poetic visual quality of the digital era, thereby unable to fully take advantage of either style. Manjhi: The Mountain Man is another of the notable NFDC (National Film Development Corporation) productions. The movie may not be a box office smash, or a critical darling, yet it is not one of those to be disregarded. It is the performances by the ensemble cast, and especially that of Siddiqui and Apte, which makes the film worth watching. By the end of the movie, the word Manjhi rings a familiar tune, albeit in a new light.